News outlets descended upon the BankUnited Center at the University of Miami Sunday night to cover the Univision GOP forum. The Miami Hurricane was in the thick of it as well, with reporters watching the event from the media room and later roaming around with video cameras. 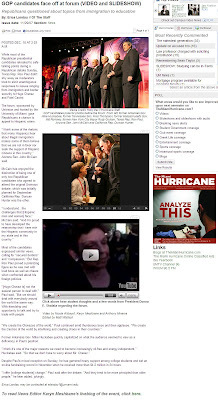 Read News Editor Karyn Meshbane liveblog the event from the press area. Read the news story, watch the slideshow and related video here.